A healthy mind dwells in a healthy body� as the saying goes doing physical exercises daily keeps our body fit, healthy and robust. 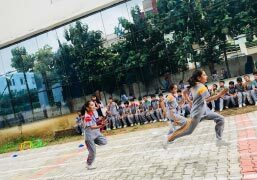 To salute the contribution of legendary Dhyan Chand on the occasion of National Sports Day, Narayana e-Techno School, Ghaziabad conducted series of events for e champs on 29th Aug 2018. These included indoor games for classes 1&2 and outdoor races for classes 3 to 5. The students enjoyed every bit of the event cheering their peer group and participating thoroughly to put up their best in all activities. For us, each and every child is a winner. Some catchy moments of the event are here for your encouragement and blessings.